A stand out among budget cameras, the MP VR-340 boasts a metal body and a higher optical zoom than most in this price range. It takes reasonably sharp and color-rich images and 720p HD video both up close (with Macro mode) and far away, thanks to the 10x zoom and image stabilization. Intelligent Auto mode offers the best settings for those who don't know their ISO from aperture and Program mode gives those who know what they're doing deeper control. Once the battery runs down, you can charge it from your computer. The VR-340 is not the fastest shooter, so it's not the best for capturing sporting moments. But if you're looking for a small, inexpensive camera for vacations, it will serve you well. 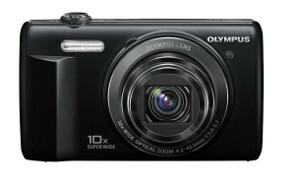 Image Sensor:	16 Megapixels (effective), 1/2.3"